In games where skills such as targeting are critical to winning, it is difficult for players with different skill levels to have a competitive and engaging experience. Although several mechanisms for accommodating different skill levels have been proposed, traditional approaches can be too obvious and can change the nature of the game. 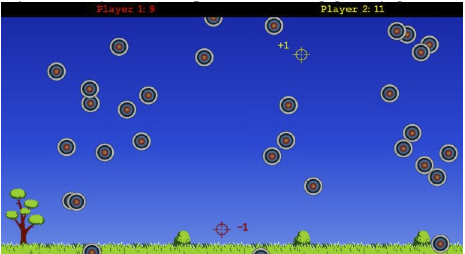 For games involving aiming to a distant surface, we propose the use of target assistance techniques (such as area cursors, target gravity, and sticky targets) to accommodate skill imbalances. We compared three techniques in a study, and found that area cursors and target gravity significantly reduced score differential in a shooting-gallery game played on a large-screen display. Further, less skilled players reported having more fun when the techniques helped them be more competitive, and even after they learned assistance was given, felt that this form of balancing was good for group gameplay. Our results show that target assistance techniques can make target-based games more competitive for shared play. Finally, we have been exploring how targeting assistance can be applied to the steering task of a driving game for balancing play. Vicencio-Moreira, R., Mandryk, R.L., Gutwin, C. 2015. Now You Can Compete With Anyone: Balancing Players of Different Skill Levels in a First-Person Shooter Game. In CHI’15: Proceedings of the 2015 CHI international conference on Human factors in computing systems, Seoul, Korea. 2255-2264. Honourable Mention Award given to top 5% of submissions. Cechanowicz, J., Gutwin, C., Bateman, S., Mandryk, R.L., Stavness, I. 2014. Improving Player Balancing in Racing Games. In CHI PLAY 2014, Toronto, Canada. 47-56. Bateman, S., Mandryk, R.L., Gutwin, C., Xiao, R.B. 2013. Analysis and Comparison of Target Assistance Techniques for Relative Ray-Cast Pointing. In International Journal of Human-Computer Studies (IJHCS), vol. 71 no. 5 May 2103, 511-532. DOI=10.1016/j.ijhcs.2012.12.006. Bateman, S., Doucette, A., Xiao, R.B., Gutwin, C., Mandryk, R.L., Cockburn, A. 2011. Effects of View, Input Device, and Track Width on Video Game Driving. In Graphics Interface 2011, St. John’s, Canada. 207-214. Bateman, S., Mandryk, R.L., Stach, T., Gutwin, C. 2011. Target Assistance for Subtly Balancing Competitive Play. In Proceedings of the 2011 annual conference on Human factors in computing systems (CHI ’11), Vancouver, Canada. 2355-2364. Honorable Mention Award. DOI=10.1145/1978942.1979287. Scott Bateman, Regan Mandryk, Carl Gutwin, and Robert Xiao: Investigation of Targeting-Assistance Techniques for Distant Pointing with Relative Ray Casting, Technical report, 2010.